It's a map of verified users of Twitter. The layout is calculated according to the mutual follow graph connecting these users, ie. relationships where @x follows @y and @y follows @x. The coloring is determined by user category (eg. sport, music, etc). The Twitter Media blog post has some good information about how to think about the visual and what we can deduce from it; what follow here are the gory details behind how it was built—for data visualization dilettantes and cargo-culters like myself. First of all: what exactly is this thing? In technical terms it's a force-directed layout of the largest connected component of the verified user mutual follow graph. 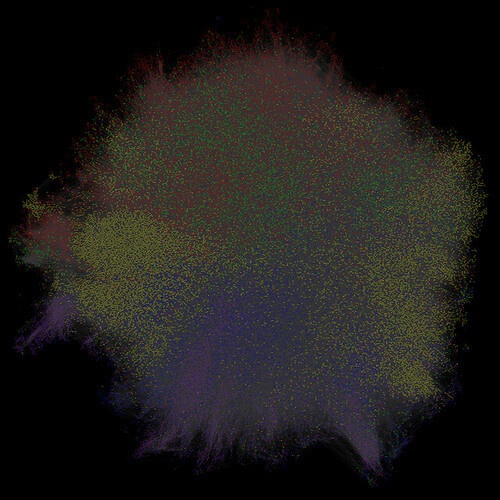 That single large connected component happens to contain over 99% of verified users; a handful are off on islands of their own, not connected to this clown hairball by mutual follows, and they're not shown. 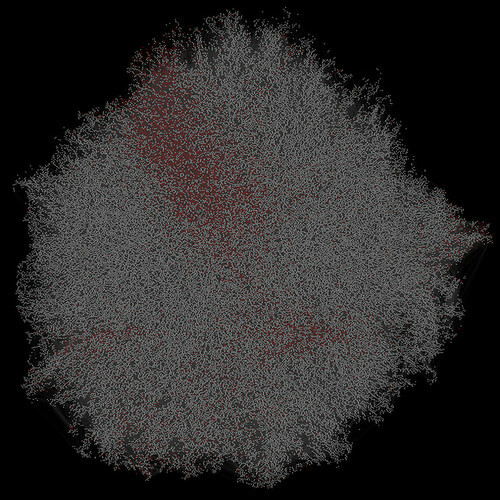 This was looking promising (and attractive in its own way, I thought) but as I added more and more users it just became a big dense white blob with no apparent structure. I figured I'd have a go at coloring the nodes by user category (sports, music, news, and so on) to see if some structure would reveal. and this showed enough promise to add colors for other high-level categories. The density of the gray edges was just sucking the saturation out—and their uniformity was obscuring further structure, I figured. So I colored the edges: any edge connecting two nodes of the same color would be colored accordingly: a yellow line to connect two sports people following each other; a red line to connect two musicians following each other; and so on. The result is what you see in the Twitter Media blog post. Not quite a gigapixel, but near enough. filter this dataset down to mutual follows. to the tune of a few million lines. rasterization: I used neato to render the graph to a PNG. presentation: I uploaded to zoom.it to share the result. I used a MacBook Air to do this work. Step (1) typically took a few minutes, (2) was 20 seconds or so; (3) was 10–120 minutes depending on the output size; (4) was actually the slowest step—a few days to process and present the final version. The graphviz tools are single-threaded and tend to be CPU-bound; you can get some wins with better hardware on (3), but only very modest ones.